On 28 November 2016, UNU-IAS organised a workshop to share projections based on research data produced by the institute’s Water and Urban Initiative (WUI), and to discuss water-related challenges and policy needs. WUI researchers provided forecasts up to the year 2030 of future flood risk and water quality deterioration of urban rivers, as well as health risks caused by water-borne infectious diseases spread through flood water for the city of Hanoi. 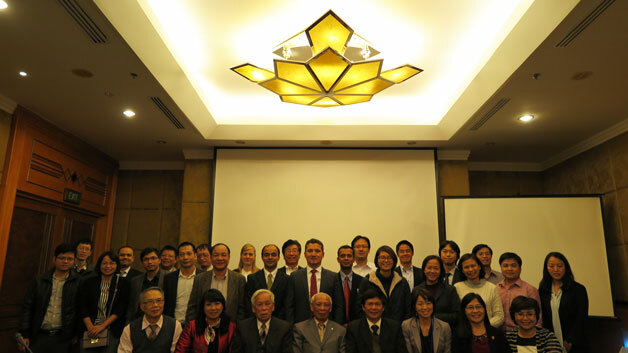 The workshop brought together experts from the Government of Viet Nam, including the Ministry of Construction (MOC), the Ministry of Natural Resources and Environment (MONRE), and the Ministry of Agriculture and Rural Development (MARD), and from the Vietnam Association for Water Supply and Sewerage (VWSA) and the Hanoi Sewerage Drainage Company (HSDC), as well as researchers from the National University of Civil Engineering (NUCE). The participants discussed priorities and challenges in wastewater and flood management for the city. Mai Lien Huong (Deputy General Director, Ministry of Construction) outlined drainage and sewerage policies and highlighted the challenges being faced in Viet Nam. Tran Duc Ha (Director, Institute for Water and Environmental Engineering) also illustrated current and planned measures for pollution control in Hanoi. UNU-IAS research highlights that, despite the planned pumping capacity in the Hanoi Drainage Plan to 2030 and Vision to 2050, there will be a significant increase in inundation areas in the future; and the southwestern part of Hanoi in particular will require greater attention in the future. UNU-IAS plans to continue advising policymakers in Hanoi and providing recommendations for city-scale planning and policy development in wastewater and flood management.